Veterinary Allergy is the first comprehensive, high quality reference dealing with all aspects of veterinary allergy in all species and all body systems involved with allergy. Providing solid breadth and excellent depth of coverage, it deals with the immunopathology of the various allergic conditions as well as with clinical presentation, diagnosis and treatment of veterinary allergic diseases. 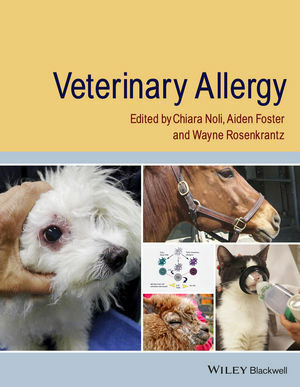 Anyone seeking information and references on any aspect of allergic conditions in any species should find this book helpful. The book will be of interest to clinicians in first opinion practice, specialists in veterinary dermatology, gastroenterology, internal medicine, and immunology as well as specialists-in-training in those fields and veterinary students. Dr. Chiara Noli graduated in veterinary medicine from the University of Milan, Italy, in 1990. After a residency at the University of Utrecht, Holland, she obtained the European Diploma in Veterinary Dermatology in 1996. Since then she works as referral dermatologist and dermatopathologist in Northen Italy. Dr. Noli is Past President and Founder Member of the Italian Society of Veterinary Dermatology, Past President of the European Society of Veterinary Dermatology and has been Board Member of the International Society of Veterinary Dermatopathology and of the World Association for Veterinary Dermatology. Dr. Noli lectures extensively in national and international meetings, is author of more than 100 articles in Italian and international journals, of nine book chapters and of three veterinary dermatology textbooks. Aiden Foster worked for 20 years dealing with companion animal dermatology cases in referral and first opinion practices. He trained in veterinary dermatology at the College of Veterinary Medicine, University of Wisconsin, USA and taught veterinary dermatology at the University of Bristol veterinary school. He has been the editor of the BSAVA Manual of Small Animal Dermatology 2nd edition and was an editor of the proceedings of the 5th World Congress of Veterinary Dermatology published as Advances in Veterinary Dermatology volume 5. He is a past president of the European Society of Veterinary Dermatology and has been editor-in-chief of the Wiley-Blackwell journal Veterinary Dermatology since 2006. He works for the Animal Health and Veterinary Laboratories Agency which deals with diseases of livestock. Wayne Rosenkrantz graduated from the University of California Davis in 1982. He obtained Diplomate status with the American College of Veterinary Dermatology (ACVD) in 1986. Dr. Rosenkrantz is a co-owner of all of the Animal Dermatology Clinics in the United States, and continues to actively see cases. He is a past-president of the American College of Veterinary Dermatology (ACVD) executive board and has been on past and current organizing committees for the World Congress of Veterinary Dermatology (WCVD) and a current member of the World Association for Veterinary Dermatology (WAVD). He has served on the examination committees for the ACVD as well as the Australian Board examinations. Dr. Rosenkrantz lectures and teaches extensively, and has published numerous articles and book chapters on small animal and equine dermatology. He is very active in clinical drug trials, research studies and consults with several dermatological therapeutic companies. He also received the ACVD Award for Excellence for outstanding contributions in veterinary dermatology in 2007.